Identity theft is real and on the rise. The Government has implemented several rules to help you prevent identity theft and stay on top of your finances. These rules are set forth by the FACTA (Fair and Accurate Credit Transactions Act) which is an amendment to the old FCRA (Fair Credit Reporting Act). These credit laws mandate that each credit reporting bureau provide each consumer with one free annual credit report. The three main credit bureaus are: Experian, Equifax and TransUnion. Any credit reporting agency is required to once a year make it easy and free for you to obtain information contained on your credit report. 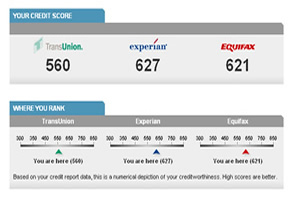 Please Note: The credit bureaus are not required to give out your credit score for free. If you want to order your score in addition to your free report, most are charging about $5.95. Annual Credit Report Request Service. When you order your reports you will need to provide your name, address, social security number, and date of birth. To verify your identity online you may have to answer a few questions about your credit accounts. • If you apply for credit and are denied. • If a company or organization takes adverse action against you because of information found on your credit report. • If you are unemployed and plan to look for a job. • If you are on welfare. • If your report is inaccurate because of fraud or identity theft. You may also obtain all three of your credit reports and scores for no charge here. This is a free trial membership.